This is a great activity for your kids to practice their sight words. This is the fry list for first grade. The words are split into 4 lists with 25 words on each game board. Once purchased, you will be able to download and have all 4 lists! 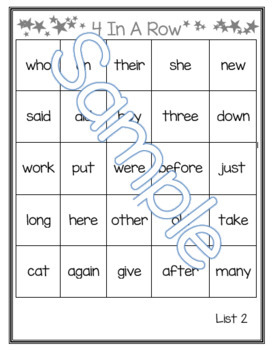 To play the game, the student take turns saying a sight word. If they get it correct, they place a chip on that spot. Then the next player takes a turn and places a different colored chip on the word if they get it correct. The goal is to get 4 in a row. Players can strategize and try to block their opponent so they do not get 4 in a row. If they say the word incorrectly, their turn is over.